Nathan received this incredibly cool Lego set for his birthday, the Tower Raid Castle. We told him he could open it up and play with it on Saturday morning. Nathan said that he was going to have a hard time putting together the castle part, and would need help with it. The castle has a single moving part, just the door at the bottom. 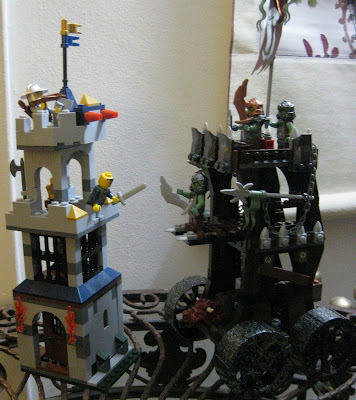 While he waited for Mike to help him with it, he put together the Troll tower cart, which has a multitude of moving parts like a battering ram and a gang plank that pulls out, and a very complicated set of instructions. How I wish I could see it from Nathan's perspective... that the simple one in my eyes would be so much more difficult than the multi-step project where the success of one moving part depends on the preceding five steps being done accurately. He's a smart kid though... I suspect that he really thought that the simple one was "boring" and wanted to do the cool one by himself and leave the grunt work to his minions.